I’m not gonna lie: I love stuff. Stuff is cool! So, I’ve got a lot of it. But some stuff is just way more important to me, compared to the other stuff. Saying I couldn’t live without it is a bit cliché and obviously not completely true (except for oxygen, which I’m pretty into), but it’s 100% the case that my life would be significantly crappier without my absolute, favorite stuff -- kicks representing the greatest basketball player ever to receive 41 technical fouls in a season, toy cars that can travel back (and forward!) in time, and craft beer from Colorado, where I spent a few post-college years either studying atomic physics in Boulder or working at a bar in Denver (whichever you want to believe). When I checked out the latest from Timberland, I thought, all right, some of this gear could be fast-tracked straight into my stuff pantheon, because a man can't live on basketball-related footwear and beer alone. So before we get into the boots, let me just say this: I'm a sneakerhead. I have a billion pairs, but most of them I can't wear in rainy/snowy weather without having a heart attack every time they're scuffed. Timberland's Abington Iceboro boots are so handsome they could turn me from a sneakerhead into a boot-head, and their Earthkeeper boots can brave anything -- even New York sludge. It's good to know I don't have to sacrifice style every time the weather gets ugly, because I'm looking out the window right now, and damn, this weather is very, very unattractive. I’m fully expecting this cardigan to win me Sweater of The Week, which is a very real and very heated Thrillist office competition. 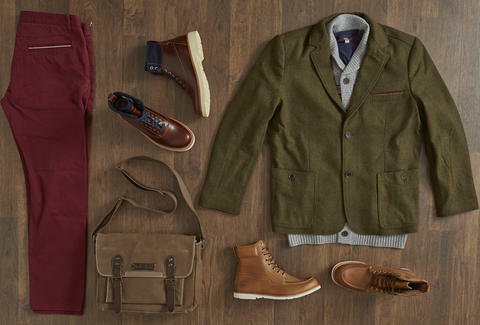 This Traveler Mountain Blazer is maybe the most crucial part of my master plan for looking like a classy man all winter. All classic and professorial, it lets me stay warm without wrapping myself in a Christmas Story-style bubble. 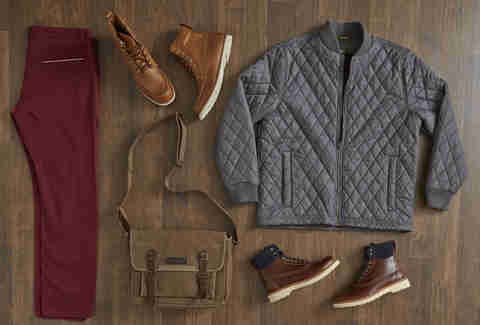 A man with one jacket is one lost jacket away from being a distraught, shivering mess people on the sidewalk avoid because he looks like he might be crazy, so I'd also add this Skye Peak Quilted Jacket into my rotation -- I like the pillowing warmth factor, and it's diamond patterned, a nice reminder to the single ladies that if they like it, they should put a ring on it. I’ve been wearing exclusively selvedge denim for about five or six years now, because it wears in so much more personally, and is just tougher -- these selvedge chinos offer a similar feel while letting me spiff things up a bit. As for the messenger, it's stylish, but it also looks tough, and if your computer bag's not tough in this town... well, outside of losing all my stuff, there'd be almost nothing crappier than a life where I actually had to write everything down with a pen.